The latest videogame adaptation to hit the silver screen, may just take its spot at the top of the list for best film based on a videogame, but still, it’s not the best film. Prince of Persia: The Sands of Time centres around our hero - Dastan (Jake Gyllenhaal), a young street orphan, who is adopted by the King of Persia - Sharaman (Ronald Pickup). He grows into his new life, alongside his foster-brothers, Tus (Richard Coyle) and Garsiv (Toby Kebbell), and his Uncle, Nizam (Ben Kingsley). The family nows plans an attack on the sacred city of Alamut, as a spy has information that the people of Alamut are forging and supplying weapons to the enemies of Persia. In the campaign, along with his brothers and Uncle, Dastan captures the city and comes into possession of a strange dagger. The Princess of Alamut, Tamina (Gemma Arterton) is captured and agrees to marry Tus, to save her city. Once returned to Persia, the King is murdered after he is given the gift of a robe, which is poisoned and the blame is left to Dastan, as he was asked to present this gift to his father. Now on the run from the armies of Persia, Dastan along with Princess Tamina try to clear their names and along the way, Dastan learns of a great conspiracy and what it has to do with the mystical dagger in his possession. Now let’s set things straight, right off the bat. 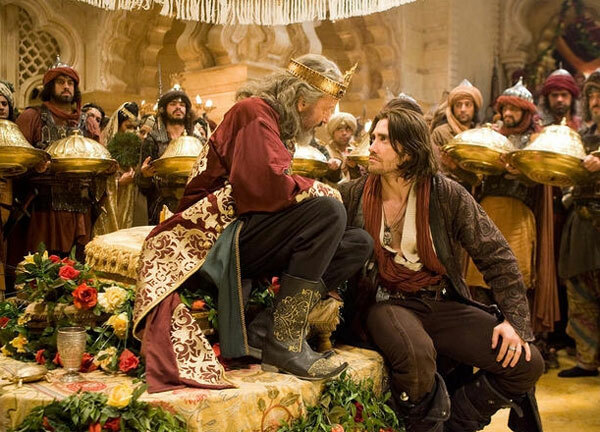 Prince of Persia: The Sands of Time is a very silly film, but it is enjoyable. Jake Gyllenhaal gives us a particularly heroic and likeable performance as the greasy haired Dastan, even if he is a Persian prince with a slight English accent. Gyllenhaal has also obviously been put through the hard yards to bring Dastan to the big screen. It’s pretty easy to see been through months of training, you just have to look at him to see that he’s put on a lot of bulk and muscle for the role, which always helps when you’re going into a big-budget action film. Gemma Arterton makes a good equal for Gyllenhaal, with the two sharing some decent chemistry during their scenes together and Ben Kingsley adds another villainous role to his long film career, with his jealous, quiet and reserved evil character - Nizam. One thing that Prince of Persia: The Sands of Time has in its favour are its impressive production values. Disney and Jerry Bruckheimer have done it again, giving the film an incredible look and style all its own, from bustling marketplaces and city streets to rolling sand dunes and beautiful palaces, it’s only just outshone by another of Bruckheimer’s successful film series - Pirates of the Caribbean with their colourful characters, epic seas and ships climbing into the top spot. The film benefits in the visual stakes from filming a good portion of the film on location in Morocco. Sound stage designs can be great and if done well, can bring the very fantastical of elements together and create something great, but nothing beats a film shot at a real location with a real sky and elements of a real world caught on film. It can’t be beaten and Prince of Persia: The Sands of Time is a lucky film in this aspects and it goes a long way to giving the film that greater sense of realism and credibility. The extra mile has also been taken to incorporate elements of the original game/s, with the most impressive of all these being Dastan using the incredible free running art known as ’Parkour’, which is always amazing to behold and it’s interesting to note that the original founder of Parkour - David Belle was the stunt coordinator on the film and coordinated all the scenes involving it. 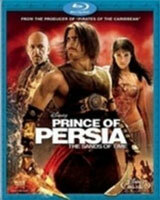 On Blu-ray, Prince of Persia The Sands of Time comes with a DVD version of the movie to watch in DVD players and a featurette called "An Unseen World: Making Prince of Persia". On the Blu-ray disc, it continues the CineExplore interactive feature which allows you to see the making of certain parts of the movie (over 40) such as "Walking up Walls" and "Ostrich Jockey Tryouts". This is definitely more insightful than the short featurette on the DVD disc. Lastly, there is a deleted scene called The Banquet - Garsiv Presents Heads and compared to the DVD version, the Blu-ray version is far superior as it is with the video (1080p) and Audio (5.1 DTS). In the end, Prince of Persia: The Sands of Time is a silly film. It’s big. It’s noisy. It is kinda fun, but you’ll probably end up forgetting it. But I will say this; It is the single best video game to big screen adaptation…so far.